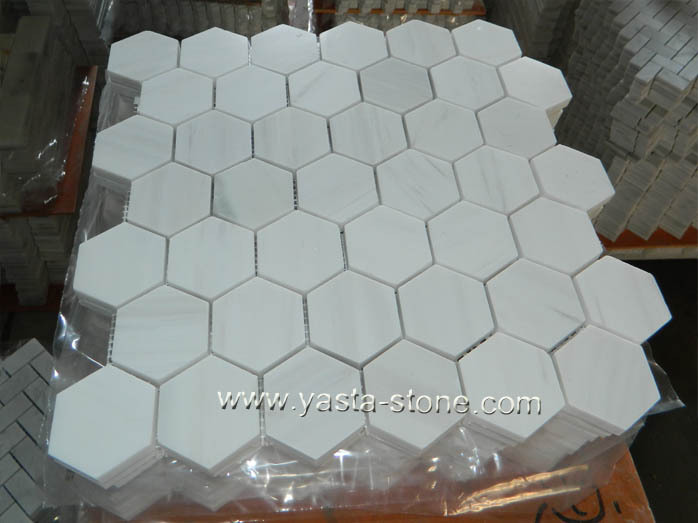 Ariston pure white marble mosaic tile.Yasta Stone is manufacturer and exporter of Marble Mosaic, Travertine Mosaic,Mosaic Patten, Onyx Mosaic,Mosaic Tile, Stone Mosaic, Granite Mosaic, Slate Mosaic, Limestone Mosaic, with Chip size 10x10mm, 15x15mm, 20x20mm, 23x23mm, 25x25mm, 30x30mm with rectangle, square, round, hexagon, irregular, oval shape. Materials, marble, travertine, limestone, slate, glass, stainless steel, seashell, sandstone. Finishes polished, honed, tumbled, crushed, antique, acid washing. Fiberglass mesh on the sheet back, foam seperators betweem sheets, plastic covers on the each sheet of tiles. Usuage wall, hall, villa, floor. Packing, Inbox and wood pallet.